Golf is a game of constant maintenance and correction. Once something works, we want to find a way to keep it working. We also know that eventually we will ease out of our groove, and we have to find the way back in. One very good way to do both of those things is with slow-motion golf swings. The golf swing happens so fast, and out of our sight, that it’s not really possible to know exactly what’s going on. By slowing down, we can feel clearly what we are doing right and what we are doing wrong. And that’s the whole point – to feel what is going on. We can’t see what we are doing, but we can feel it. The feels we are looking for are the ones that bring the club back square and on plane, and return the clubhead to the ball with the desired impact geometry, and, hopefully, with a good amount of speed. 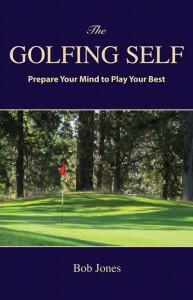 The best way to teach your unconscious mind* what those feels are is to practice swinging slowly. The slow-motion swing allows you to verify the feels of what you are doing right. If anything gets out of whack, you can sense it right away. That is feel of the wrong movment. Even though it might be your habit, it needs to change. If you need to make a correction, its feel might be odd, but because the slow swing allows you to carefully monitor what is going on at all times, you’ll know it’s right. Maybe you’re working of a slight change. Practice it in slow motion first, to make sure you’re doing it the way you want to, and you’re not still doing what you’re trying to get away from. I’m not saying that there is now no reason to have a lesson, but there is a lot you can diagnose yourself so that when you get that lesson, it will be fine tuning, rather than going back to basics. Pay your money to learn what you can’t figure out by yourself. The first time I heard about this trick was on a Golf Channel Playing Lessons With the Pros episode featuring Brad Faxon. He said he, and other touring pros, did this all the time at the range, for the very purposes I described above. Now that it’s rainy weather and you don’t get to play much, and it gets dark early so going to the range after work isn’t really an option, try working on slow swings at home. Get a lesson and spend the winter getting everything in your swing lined up right. *Most people use the term “subconscious mind”, but my psychologist friends say “unconscious mind” is correct. After you get a general idea of how to swing a golf club, it becomes a matter of paying attention to the little things, that fine tuning which makes all the difference in the world. One of the little things is grip pressure, which means having a light grip pressure. The night before Greg Norman was to win his first British Open title, Jack Nicklaus, who was not in contention, advised Norman to keep an eye on his grip pressure the next day, since it can tighten up under the stress of competition. That’s all Nicklaus mentioned, because he knew that was the only thing he needed to say. How light should your grip pressure be? It can be too light. Then the club would move around inside your hands during the swing. A slightly off-center hit could twist the clubface, costing you distance and direction. Sam Snead’s advice to hold the club like a little bird isn’t good advice. I’ve held a wild sparrow in my hands, and that’s way too light for swinging a golf club. The key is how firmly you hold the club at the start. Sole a club, say a 6-iron, and take your grip with just enough pressure to pick up the club without it drooping in your hands. The grip should feel like it presses gently into the pads on the inside of your fingers and palms. Your hands will tighten a bit as you swing, but swing and practice just keeping them from tightening too much. This is a feel thing. When you practice, err on the side of too light a grip. It’s easier to know you have to tighten up a bit more than to know you have to loosen it up a bit. Also to be attended to is the condition of your grips. If they are worn smooth, or are dirty, they will slide around in your hands, causing you to hold on too tightly just to prevent that. Make sure they have a tacky feel. Here’s the difference grip pressure makes for me. When I hold the club too tightly, my right wrist gets tense and unable to move. That gets my hand jammed up against it, and the clubface closes on the backswing. The result is a hook with my irons, and a duck hook with my driver. When my grip pressure is light, my wrist can bend the way it is supposed to on the way back, keeping the clubface square. The result is very straight ball flight. If you lighten up your grip pressure, that little thing can have the affect of opening up your swing, and better shot-making. The pursuit of distance makes us do damaging things to our swing, mainly because of swinging harder. The surest way to get more distance is not to swing harder, but to hit the ball off the center of the clubface. That takes a lot of practice, which I encourage you to do. There is another way to get more distance that is easy to do and doesn’t require any changes to your swing. That way is to be relaxed during your swing, thereby increasing your swing speed. You might have found out that putting lots of strength into your swing also puts tension in your muscles which actually slows down your swing rather than speeding it up. 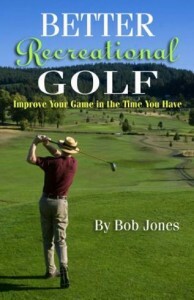 What I want you to do is take an iron, say a 6-iron or a 5-iron, and make your swing without a ball in front of you. Listen for the sound the whoosh makes as the club goes through the impact area. That sound is an indicator of how fast the club is traveling. The higher the pitch of the whoosh, the faster the clubhead is moving. You don’t have to buy any of devices you see on TV that measure your swing speed. The sound of the whoosh will tell you everything you need to know. Just try a more muscular swing now, to show yourself that it won’t do any good. The pitch will be the same, or even lower. Even if the pitch does go up, ask yourself what you are doing to clubface control. Odds are you’ve made clean contact more difficult to achieve. Now set up and relax your grip to just enough that you can swing and keep the club under control. Try this a few times, relaxing your grip more each time, and keep it relaxed throughout the swing. You might be surprised at how lightly you can hold the club and still control it. Now relax your arms and swing a few times. Relax your torso. Relax your legs. 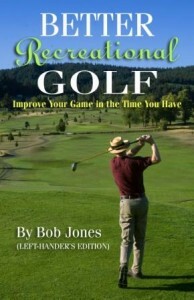 Get your entire body relaxed, maintaining that relaxation as you swing. I am sure you will find the pitch of the whoosh rising, proving that you are swinging faster. More swing speed is generated by more relaxation, not by more effort. Practice this, learn to trust it.